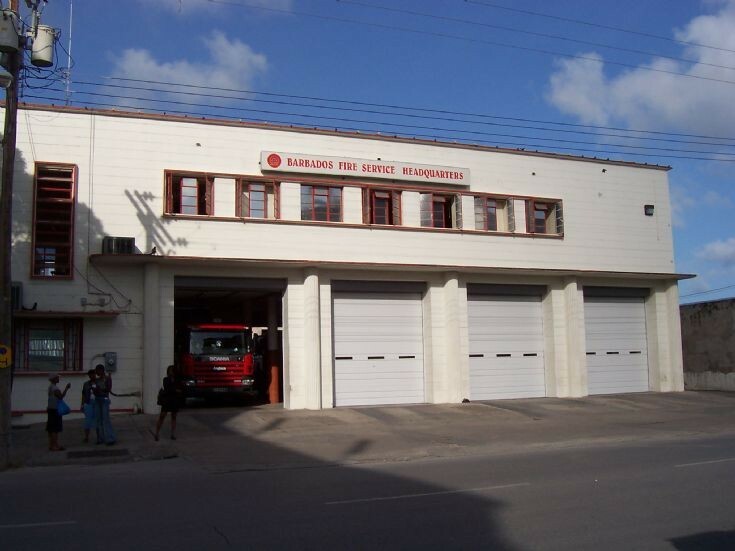 Matt, thank-you for posting an excellent series of pix from Barbados that included the fire stations. I have some slides taken in 1991 by Simon Adamson when he visited the brigade whilst on his way to do a survey for the UK Foreign and Commonwealth Office of fire brigades in the dependent territories of the British Virgin Islands, Montserrat, Anguilla and the Turks and Caicos Islands. Subsequently Fire-Aid International sent fire appliances to those brigades. From the above list it would appear that the fire service reuses registration numbers . It seems that Mr Adamson only photographed the appliances at Headquarters (Bridgetown) and at the airport although some appliances had come in from out stations. If he is agreeable, I'll see if I can scan in some of his pix and send them out. I wonder what happened to the HCB-Angus built Bedfords, probably now in little pieces! Added by Simon Rowley on 04 January 2010. @Simon - Would love to see whatever photos you may have of the Barbados Fire Service. Added by Glyne Alleyne on 10 December 2010.
all of those bedfords are long gone except for one with a bucket escape, they were bought on auctions or destroyed in accidents. the ones bought at auction were used on farms as water pumps and rusted away in the fields. Added by Mark clarke on 27 July 2012. Added by Alan Smith on 14 April 2015.